A modern take on grandma's china closet, this charming curio cabinet holds dishes, glassware and collectibles behind two tall glass doors. 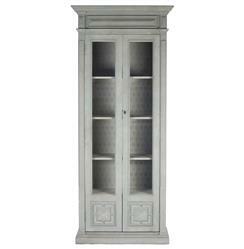 Antique distressed elm is finished in weathered grey with hints of sage green. Whether you're into vintage, eclectic or French Country, this stately cabinet will add just the right storage to your space.